At Oakfield Beams & Framing, we have an extensive supply of fireplace mantels, shelves, beams and oak fire surrounds. With finishes ranging from contemporary to rustic, we are certain we can supply just what you are looking for. Whether you are in need of a large traditional bressumer beam, a fresh looking floating fireplace mantel, a full oak fire surround or a small set of shelves for an alcove, we are able to supply. 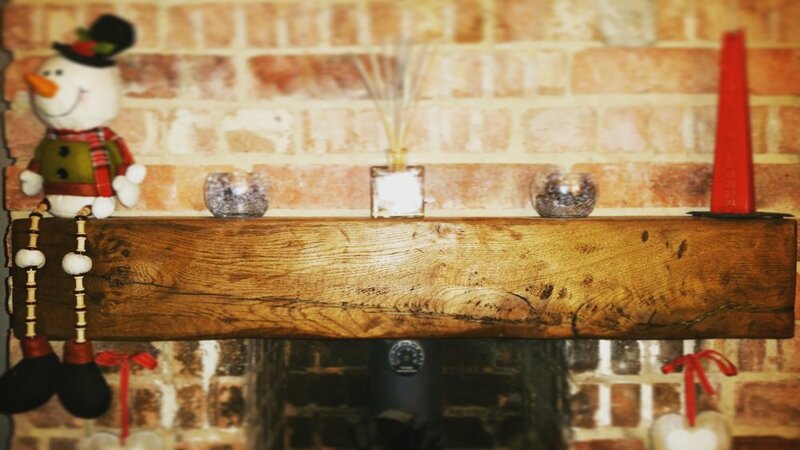 Oak fireplace beams and shelves need to be stable, so we only use the best quality air dried oak and reclaimed beam sections, this can give you piece of mind that the oak we supply has already done the majority of its drying and moving. We can also offer full fire surrounds. This beautiful rustic fireplace surround is from old seasoned oak, hand worked and waxed to a stunning finish. This air dried oak fire surround is plain triple sanded with a very slight chamfer. The client wanted contemporary styling with character. They were very happy with the finsihed product! We now also offer corbels in varying styles and finishes to complete your bespoke mantel set. Just ask for details. This is and air dried oak mantel beam. Rough sanded with a clear waxed finish. A very popular beam! This is a fine sanded polished oak beam. Really smooth to the touch and contemporary with a little rustic character. We can also give you advice on how to fit your fireplace beam or mantel, using our simple fitting kit with instructions. Here you see a basic diagram of the best way to install your floating fireplace mantel. Even if you have a fireplace mantel already installed that you don't like, but are unable to remove due to structural properties, then don't worry. Get in touch and we can hollow out a beam for you leaving the ends looking solid. You now have a superb new beam casing that can be placed over the top of the of the old one! Just let us know the dimension of the beam you have, how far you would like the new beam to protrude from the wall and we will work out what size casing you need and give you a list of finishing options. If you have any questions, or may be interested in an oak mantel but are not sure about sizes or finishes, then please feel free to contact us. Our team will be happy to hear from you, and help in any way we can.